This book celebrates the exemplary achievements of non-profit organizations in the Greater Louisville and Southern Indiana region during the past decade as recognized by the Center for Non-Profit Excellence (CNPE). Schmall describes CNPE's five award categories "Vision, Leadership, Governance, Collaboration, and Diversity" and reveals how these key characteristics are vital to creating a vibrant, successful social sector. 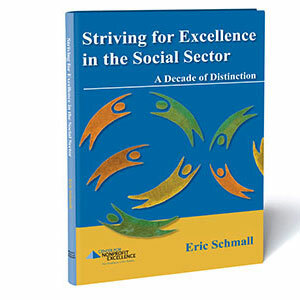 As told through some fifty stories, Schmall examines the award-winning organizations that have been recognized for outstanding achievement in these categories and offers a compelling vision of how they will shape mission success in the coming decade. This book is a culmination of ten years of critical evaluation by CNPE to find and recognize the non-profits that best embody and actualize these core principles. The principles are applicable to any great organization; the award winners highlighted in the book successfully apply these principles while doing good and necessary work in our community. Eric Schmall is the Director of Consultation with CNPE. CNPE provides the greater Louisville region, which has more than 1,600 non-profits, with a central point of access to information, best practices, professional development, and hands-on consultation to help the social sector reach its individual and collective aspirations. Established in 1999, CNPE's mission is to serve the social sector's quest for excellence through education, consultation, and network advocacy. For more information about the CNPE, visit www.cnpe.org. AUTHOR: Eric Schmall, Director of Consultation at the Center for Nonprofit Excellence (CNPE), Louisville, Kentucky CNPE provides the greater Louisville region, which has more than 1,600 non-profits, with a central point of access to information, best practices, professional development, and hands-on consultation to help the social sector reach its individual and collective aspirations. Established in 1999, CNPE's mission is to serve the social sector's quest for excellence through education, consultation, and network advocacy. Philanthropy is Greater Louisville's ornament of grace. This new book provides insight into Louisville's public service ethos and the supporting role CNPE plays through collaboration, shared learning, advocacy, promotion of innovation and excellence. It is a must-read for all donors as well as board, administrative and executive members of the non-profit community.